With so many double-storey terrace houses that look the same these days, it’s hard to find one that stands out from the rest. Luckily, the J-House designed by Design Collective Architects located in Subang Jaya, Selangor is a work of art that meshes nature and modern features together. 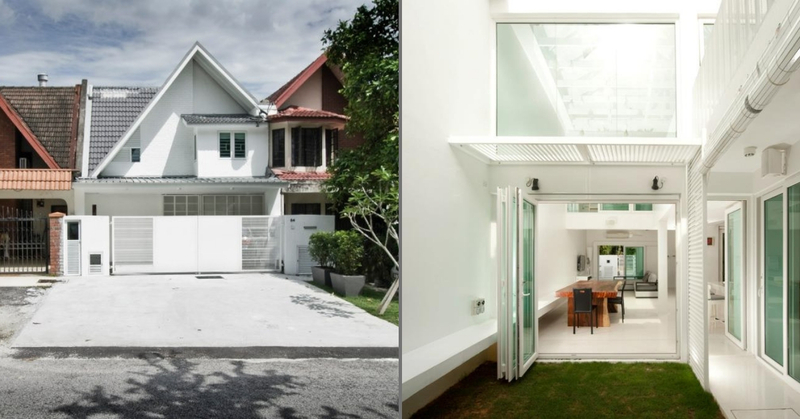 Although the shape of the house looks like its neighbours but at first glance, you can already spot the difference thanks to the bright white palette. Inside the house, one of the things that will attract your attention is the private vertical garden that promises to bring some much needed fresh greenery into your home. There is also a plot of grass on the outside area accessible only from inside the house so you can throw as many garden parties as you want in the privacy of your home. Continuing with the theme of a white and contemporary look in the home, the rest of the house’s decor is also in white interspersed with some pops of dark neutral colours. The dining table is a rich, warm wooden colour that adds an organic element into the home while the living room has a light grey sofa for contrast. Liberal use of open spaces and windows allows lots of natural light to illuminate the home and gives it a really fresh and airy feel. The designers also made sure that they opened up the house so that it looks more spacious and with the high ceilings, it gives a rather unique loft-like appearance. If you look up, you can see that there acrylic roof tiles that give you a rather charming view of the outside sky as well. Fret not if you are upstairs and want to enjoy the vertical garden too because they have a void space made that allows the residents to chill and look at the garden and living room below. An outdoor terrace for those lazy lounging days can be utilised for any socialising activities and the designers also made sure to study the solar conditions to ensure that the house does not receive excessive heat. All images from Design Collective Architects Facebook page unless otherwise stated.